Renowned jewelry brands and independent designers from around the world descend upon Las Vegas each June to unveil their latest collections at the Couture show held at The Wynn. Far more than a tradeshow, this is a must-attend event for exclusive luxury jewelry retailers and global media outlets, all of whom are eager to discover fresh, new jewelry creations in a highly-curated environment. While innovation did abound, there were clear trends spotted throughout the show as well. Enjoy the unique perspectives designers brought to these six trends in this slideshow featuring emeralds, triangle motif, front facing hoops, aphids, jade and stars. 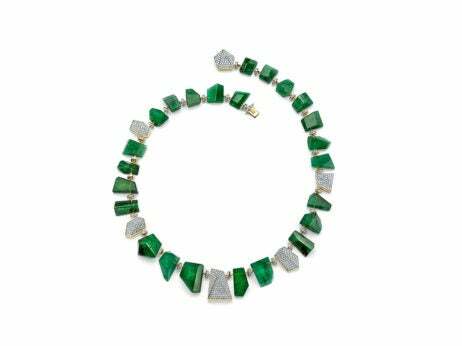 Although the emerald is typically considered a more traditional gemstone, it emerged on this year’s Couture show scene in much more contemporary ways. Some designers chose an edgier approach while others opted for sheer drama. 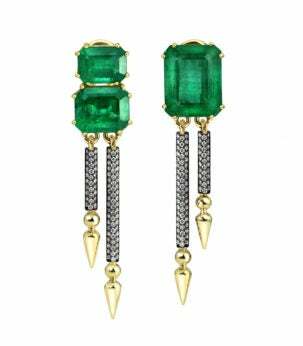 Standouts were Sarah Hendler, who combined the asymmetrical placement of emeralds on posts with dangling diamonds and golden spearheads, and Pamela Huizenga, who used emerald nuggets offset by free-form golden shapes with pavé diamonds. Click through for the Triangle Motif trend.